"This is a wonderfully engaging text that grabs the reader's attention with the first paragraph. And it is much more than just another volume in the genre of devotional literature. Wilson writes in the grand tradition of Wesleyan spirituality that begins with John Wesley himself." -- Dr. Ruth Tucker, Church Historian, bestelling author of several books, including From Jerusalem to Irian Jaya, and Parade of Faith. "Every pastor and other spiritual leaders should read this refreshing book. The greatest problem we repeatedly face is leading without spiritual power. All of us have been there, are there now, or will be there sometime in the future. Mark has addressed this problem face on and shares a solid, practical, theological means of defeating this enemy. Readers will truly discover how to revive their passion and fulfill their God-given purposes." "Refreshing and inspiring, Filled Up, Poured Out will revive the spirits of pastors and church leaders and help them minister from the overflow of God's presence." 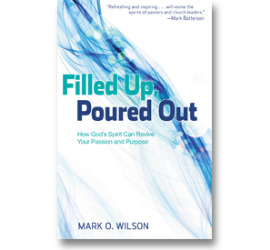 Filled Up, Poured Out: How God Can Revive Your Passion and Purpose is now listed on Amazon for a special pre-order price. The book will be released in April of 2012.